The ringing chamber is the room with the round-topped glass windows, at the third-story level. The fourth story is the windowless intermediate chamber, which moderates the sound of the bells for the ringers. The bell chamber is at the fifth-story level of the gabled extensions on each side, which were included to provide room for the bells. Above the gables are louvers that can be electrically opened to let out the sound of the bells. 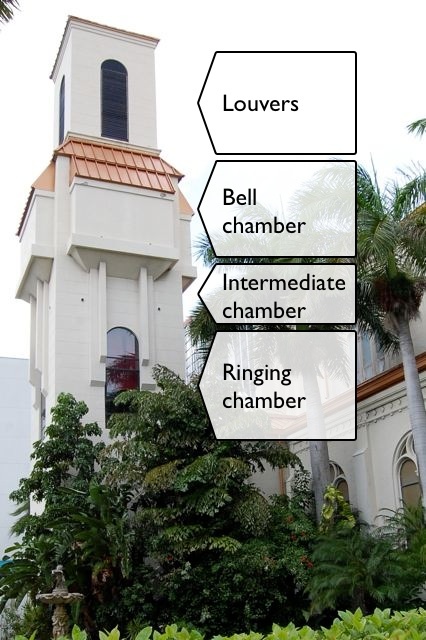 The tower’s narrow cross-section meant that the bell chamber had to be extended on each side to give room for the bells, giving the tower a cruciform silhouette. A radial bellframe was a necessity in order to reduce the horizontal forces generated by the swinging of the bells to a level that the narrow tower could withstand.